This is pretty easy and by no means do you have to be a real handyman to figure it out. I’ve read forums and websites where guys are welding new grates into place! Yeah, I can’t do that. 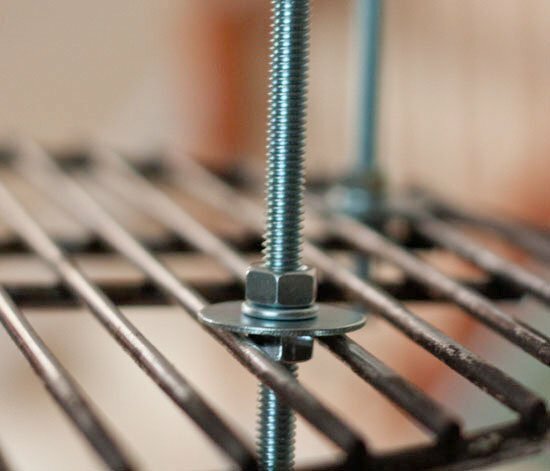 For about $5 you can buy bolts, nuts, and washers and can easily do this. 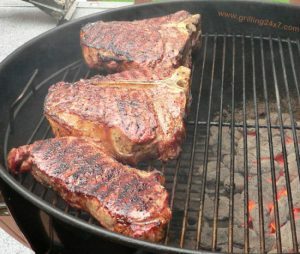 I chose to use the grill grate from my Smokey Joe mini Weber kettle. 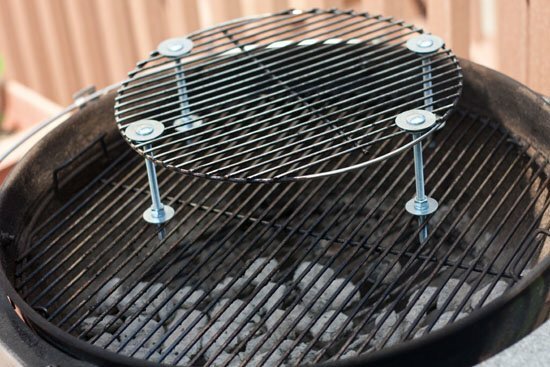 I chose to use this because I already had it and it is significantly smaller than the Weber Smokey Mountain’s grates and the standard Weber kettle’s grates. I wanted it a bit smaller so I could have room to get my hands or tongs down around the new grate. 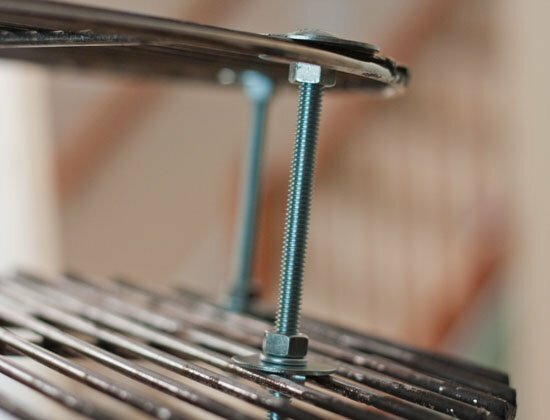 I started by slipping a wide washer over the carriage bolt and sliding the bolt through the grates. I then put a washer on the bottom of the grate and put a nut on to tighten. I did this for each bolt. I tried to position the bolts in a way where I would have the most surface area underneath of the new grate. 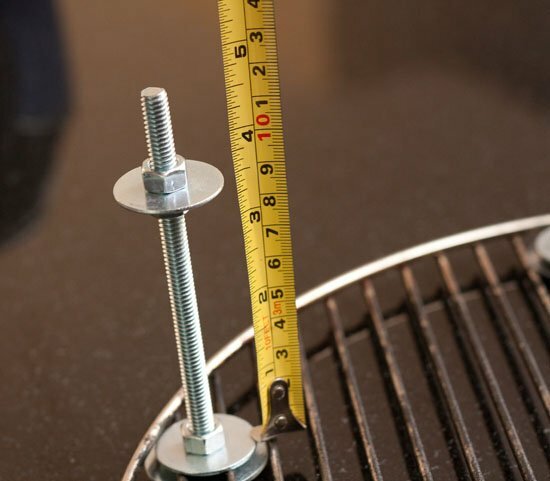 You can imagine that the bolts arranged in a perfect square may not allow a large rectangular brisket flat to fit. I chose to keep the bolts in a rectangular pattern allowing a wide opening under the new grate. You wouldn’t want the “columns” of your new grate to bump up against food. 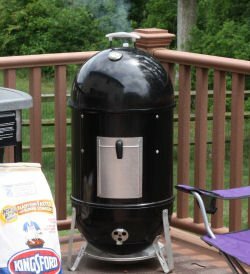 Next I measured the distance between the top and bottom grate of the Weber Smokey Mountain (WSM). It was about 8 inches. So that meant that I roughly wanted this “third grate” to be 4 inches away from the top and bottom grate that way it would be in the middle. 4 inches doesn’t sound like a lot of room but it will fit a brisket flat just fine. So about 3.5-4 inches from the top of the carriage bolt place a nut, a lock washer, a wide washer and another nut. Try to sandwich all of these with nuts and make sure the lock washer is in the middle so things won’t slip around. You can see this arrangement better in the photo below. Once you do this 4 times you’ll have four “legs” to stand the new grate on. There should be an extra inch or so hanging down on these “legs.” This is ok, it allows the new grate to fit a bit more securely over top of the grate below. 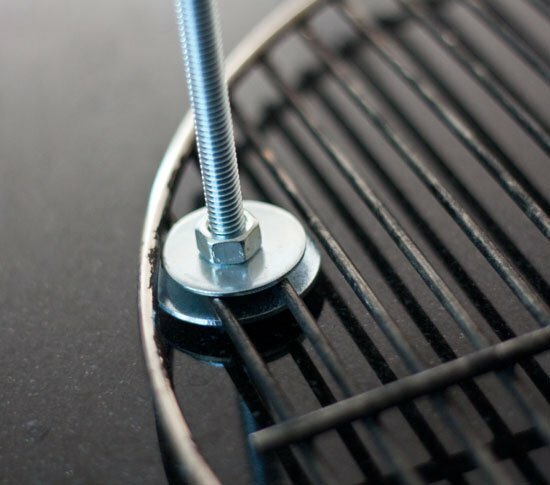 You can see from the above photo that this works great on a standard large Weber kettle, such as the Weber Performer. This can come in handy for warming buns, or keeping veggies or corn warm while you are grilling something else. 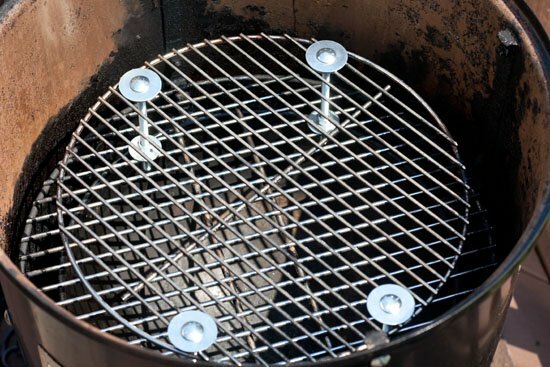 This can also add surface area to an Ugly Drum Smoker or any type of grill or smoker. Above you can see my new grate sitting in the WSM smoker. I think two brisket flats will neatly fit in here, one on each grate. In the above shot you can sort of see all three grates on the WSM. The plan is two sit two bone-in Boston butts on the top grate, then have one untrimmed brisket flat sitting on each grate below! This is a lot of meat for the little WSM but I am certain it will handle it! 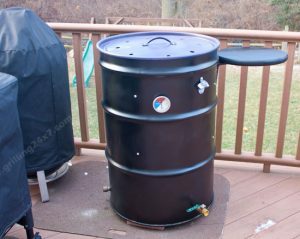 And just imagine how many smoked stuffed jalapeno peppers I can now fit on this smoker! 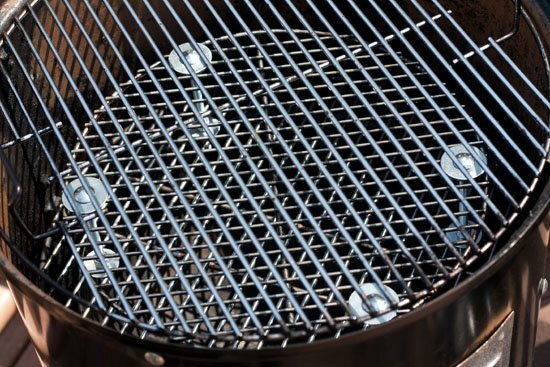 Adding a Third Grate to a Smoker is an easy way to add a lot of grilling surface area. I realize there are no food photos in this update. 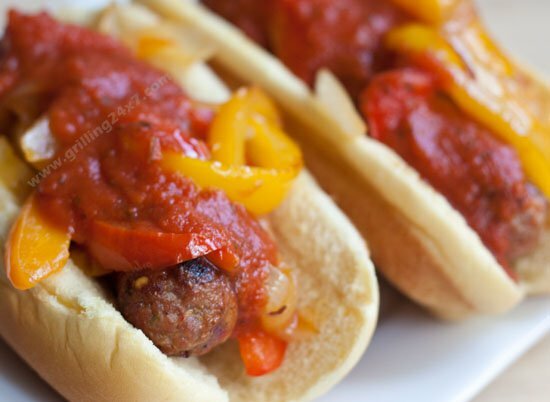 Sorry about that – Here’s a photo of an Italian Sausage with peppers, onions and tomato sauce! Jeebus Christmas, Joe. His daughter is probably married by now! !